Army Emergency Relief (AER): A private, nonprofit organization established to help Soldiers and their Families in emergency financial situations due to no fault of their own. Education Program: Offers need-based scholarships to help eligible Army Families with education costs. 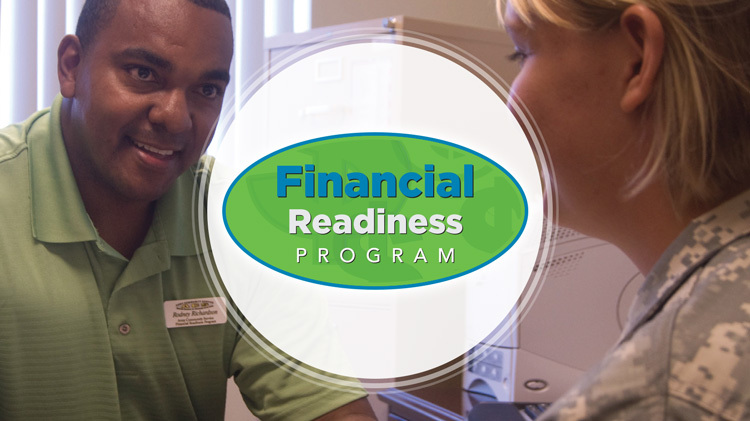 For more information about how the Financial Readiness Program can help you, contact your nearest Army Community Service Center. Thrift Savings Plan: A Federal Government-sponsored long-term retirement savings and investment plan, available for both Federal civilian employees and members of the uniformed services. U.S. Savings Bonds: A shorter-term savings option with competitive interest rates and backed by the full faith and credit of the United States. Military Saves: A component of the nonprofit America Saves and a partner in the Department of Defense’s Financial Readiness Campaign, Military Saves seeks to motivate, support, and encourage military Families to save money, reduce debt, and build wealth. Money Matters: A mobile-optimized resource with calculators for savings, debt reduction and other reference material in one location. Housing Resources for Military Members: The National Military Family Association has compiled a great list of resources to help Military Families who are struggling with the pitfalls of the housing crisis. Army OneSource: Network of the services and delivery of support to Soldiers and their Families. Military OneSource: A Department of Defense-funded program that provides comprehensive information on every aspect of military life at no cost to active duty, National Guard, reserve members, and their Families. Office of Servicemember Affairs: A component of the Consumer Financial Protection Bureau helps to educate and empower military members, veterans, and their Families in the consumer financial marketplace. Saveandinvest.org: A project of the FINRA Investor Education Foundation, a free, unbiased resource dedicated to your financial health. Helps you make informed decisions through easy-to-use tools and resources, and arms you with the information you need to protect yourself from investment fraud. Better Business Bureau Military Line: Provides specialized education and support services, which meet the needs of active and retired military personnel and their Families. Pre-screening and counseling for Soldiers who qualify for the FSSA entitlement. FSSA is an entitlement authorized by Congress in 2001 and created to supplement the Soldier's Basic Allowance for Subsistence (BAS). This entitlement will not exceed $1100 per month. Information and application for FSSA is web-based and can be found under the "Life Events that Impact Your Benefits" tab. Please browse our Financial Readiness Resource Library. Printable PDF resources are available in the Forms and Publications tab below. On January 1, 2018 the military retirement system changed to the new Blended Retirement system. It has three components: The Thrift Savings Plan (TSP), continuation pay, and an annuity. Service Members who joined after 2006 but before January 1, 2018 will have the choice to stay with the existing system or to opt in to the new system. Those who joined before 2006 will stay with their current system. Contribute 1% of your basic pay to his or her TSP 60 days after entering into service. Match your contributions (up to an additional 4% when you contribute at least 5%) at the start of your third year of service. After 12 years of service, you will receive a cash payment if you opt to stay for 4 more years. The payment will be two and a half months of basic pay for Active component members and half a month's basic pay for Reserve members. The Blended Retirement system annuity is a defined benefit (monthly annuity) similar to the 20-year retirement system now in place. Members who retire will still get their monthly annuity pay, but at a reduced amount of 2% instead of 2.5%. www.creditkarma.com use as an alternate if you cannot retrieve from annual credit report web site or to review credit scores. Is your full name, birth date, and address correct? Are employers, creditors, or home addresses listed that do not belong to you? Are your accounts correctly reported as open, closed or delinquent? Do judgments, such as liens or bankruptcies, appear correctly? If there are any inaccuracies, contact the credit reporting agency and creditor that furnished that information to get it corrected and to file a dispute. If they do not fix your report, you can file a complaint with the Consumer Financial Protection Bureau: www.consumerfinance.gov/complaint. A credit score is a number that lenders and other companies use to evaluate your credit risk, at any given point in time. Scores range between 300 and 850. The higher your score, the less risk you present to creditors. Not all student loans are the same, especially federal and private loans. Federal student loans are offered through the U.S. Department of Education. Private loans are offered by banks, credit unions, or schools. Federal loans tend to offer loans at lower interest rate than private loans. Visit: www.studentloans.gov OR www.studentaid.ed.gov/repay-loans to determine the lender(s). Visit: www.studentaid.ed.gov/types/loans/federal-vs-private to learn more about the difference between these loans. Your loan account is assigned to a collection agency. The Service Member Civil Relief Act extends consumers rights to service personnel; there is added protection from default judgements as well as the ability to cancel contracts and leases. Visit: https://scra.dmdc.osd.mil/scra/#/home for more information. www.nrd.gov. The National Resource Directory is a partnership of the Departments of Defense and Veterans Affairs. This online directory connects service members and veterans with resources to benefit them and their families. What is TSP? TSP is a retirement savings and investment plan for Federal employees and members of the Uniformed Services, including the Ready Reserve. TSP offers the same type of savings and tax benefits that many private corporations offer their employees under 401(k) plans. Where do I go to sign-up? Civilian personnel have the options to contribute a percentage of their pay or a dollar amount. Contribution elections must be stated as whole percents. The dollar amount that is withdrawn will be adjusted if the amount of your pay changes.